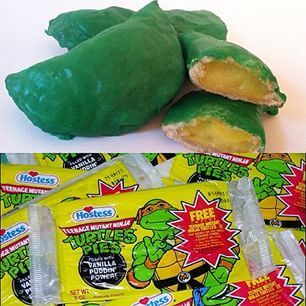 The Hostess Teenage Mutant Ninja Turtle Pies featured a green glazed pie crust that was filled with Vanilla Puddin’ Power or mutagen goo as it’s referred to in the commercial (both sound pretty delicious to me). I would bet the majority of us never got to taste these (let’s say…delicious?) pies, as they were only around from 1990 to 1991 (that’s a pretty solid run). I could see myself still using all of those prizes in my day to day life right now. But I think the cherry on top (or the puddin’ power inside if you will) has to be the commercial for these pies, in which the Ninja Turtles rap about how great the pies are by mentioning no less then three times how they are made “Fresh from the sewers to you!”. Enjoy.